This stunning timber wall relief is something to be seen in the flesh. 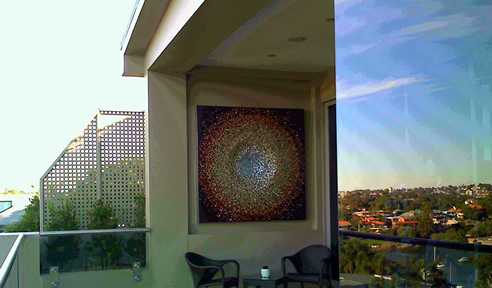 A large piece at 150x150 cm by artist A.H really sets the seen on this wonderful Sydney balcony, mixing excellent views with excellent art work can produce a wonderful entertaining area. Do you have a space that needs something special? SOHO Galleries has over 20 years of exhibition history to be offer a board selection of artwork for your home or office. Or come into the gallery to select work from our range of painters and sculptors displayed over three floors of stockrooms. Alternatively search the site www.sohogalleries.net to preview the work before coming in to see it in the flesh. If you're out of town or interstate we offer local, national and international freight services by dedicated art couriers, to delivery your artwork to your door. Exhibitions in the gallery are held on the first Saturday of each month and offer the range of artwork that inspires, stimulates and begs the question.... where can I fit this piece of art in my life...? I would like to enquire about Soho Galleries Sydney.